When designing a room, many people tend to focus on the walls and the furniture. Unfortunately, somewhere along the way, designers began neglecting the ceiling. The ceiling is now often one of the more overlooked areas of the room. However, a ceiling could go a long way toward making or breaking the appearance of a room. A proper ceiling design can literally transform a room. Not buying it? Below, you’ll find reasons why ceiling design is essential for any place. Additionally, you’ll see details explaining why metal tiles are an excellent choice for ceiling design. When designing your room, you should view your ceiling as a fifth wall – yes, it’s that important. No matter if you’re looking for softer hues or making a bold statement, your ceiling can help set the tone. Additionally, a ceiling will go a long way toward making a room feel bigger or smaller. Many people fail to recognize that a ceiling is really noticeable. A few basic design features could go a long way toward helping you achieve your design goals. For example, using something such as a coffered ceiling is an excellent way to overhaul the design of your ceiling dramatically. Coffered ceilings can give dimension and texture to a space and are relatively easy to install and can be used with metal ceiling tiles. They are a classic ceiling design that blend seamlessly with many architectural styles. If you have a smaller room that you are looking to make bigger, you can consider tricks such as removing crown molding or painting the ceiling white. Additionally, you should also think about the structural aspects of the ceiling. If you have a room with limited space, using a drop-in ceiling will likely make the room feel smaller than it already is. These are often aspects that people fail to think about when designing a room but could go a long way toward helping them accomplish their goals of a redesign. Instead, you should consider utilizing something like a cupola ceiling. Not only are these ceilings architecturally-stimulating, but they admit a ton of natural light into a room. This ceiling could add an entirely new dimension to any room in your home. When it comes to evaluating a ceiling’s potential, it’s crucial that you start with a blank canvas. Take a look at what you can, and cannot, alter structurally. Otherwise, your remodeling costs will become significantly more expensive. Fortunately, thanks to tin ceiling tiles, you can add character to your ceiling and undergo a dramatic overhaul without breaking the bank. One of the primary reasons to consider using tin tiles when redesigning your ceiling is because of how many options are available. When browsing the Metal Ceiling Express website, you will find hundreds of metal ceiling tile options. We are confident that when looking through our online catalog, you’ll be sure to find a color and design that fits your remodeling options. This also lets on to another primary reason why metal tiles are an excellent choice for your new ceiling. Metal ceiling tiles are textured, providing character that you otherwise may not easily achieve in a room. When painting or using wallpaper, you are limited to basic two-dimensional designs. Even if you are installing wooden planks, your design options are quite limited. But when using metal ceiling tiles, the opportunities are endless. We’re confident you will find a design that can help add character to your ceiling, making it the focal point of a room of which you’re proud. 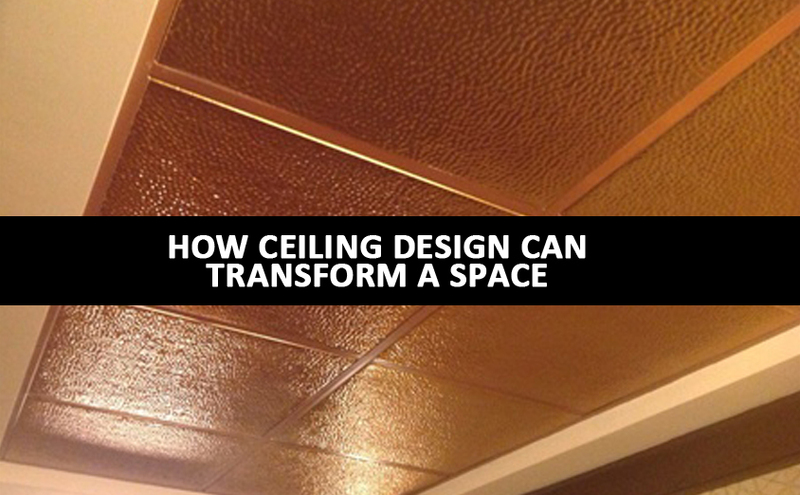 Similarly, metal ceiling tiles are beneficial because they do not take away from the space of a room. Tin tiles are thin. Although you have the choice to install drop-in ceilings with metal tiles, many prefer to merely nail the tiles to the ceiling. Because they are so thin, you will not lose the depth or space features of a room. In smaller rooms where space is valuable, this is incredibly important. Lastly, you should think about using tin ceiling tiles because of how easy they are to install. As mentioned, many prefer to fasten the tiles to their previously-existing ceiling. You can reasonably install a tin ceiling into a room in a day or so.